Matt received his degree in Interior Design from the University of Wisconsin - Madison and practiced design professionally for almost 10 years before a chance phone call sent his career in a bit of a different direction. A local producer looking for a designer to host a new renovation show opened the door to a whole new way for Matt to bring design into the world. You may know Matt best for his work over the past decade hosting shows on HGTV and DIY Network, including Bath Crashers and Ellen’s Design Challenge. Matt has worked with Renewal by Andersen on both the "Get Inspired With Matt!" series, as well as the "Renewal by Andersen: Generations" web series. Designer and TV host Matt Muenster was finally ready to tackle the renovation of his historic, mid-century modern home. “One of the coolest things about this house is the windows,” he says. “Floor to ceiling, all those views and natural light… BUT it also has the original 1962 windows in it, and I’ve been wanting to replace them for years. It’s time.” Muenster, who has given TV audiences a peek into a lot of people’s renovations over the years, is now turning the camera around, and giving you a look into his own home remodel in the web series “Get Inspired With Matt.” Check out episode 1 here! Episode 1: "I've Got a Window Problem"
Options, we've got options...we've got lots and lots of options! In this episode, Matt meets with his design consultant Kim and together they build the perfect windows for his mid-century modern home remodel. Size, shape, style, interior and exterior colors, grilles, glass, hardware... if you want to configure it and make it your own, we can help! Go behind the scenes of the in-home consultation and design meeting with Get Inspired Epsiode 2: "Choosing the Right Window." Episode 2: "Choosing the Right Window"
In episode 3, Matt meets with an Install Project Manager - his personal construction concierge. An Install Project Manager not only measures the openings to make sure each window will be custom made to fit the exact hole in the wall. He/she will also make note of any unforseen details that may impact the installation. Lastly, the Install Project Manager will make sure that the homeowner is prepared and knows what to expect come installation day! 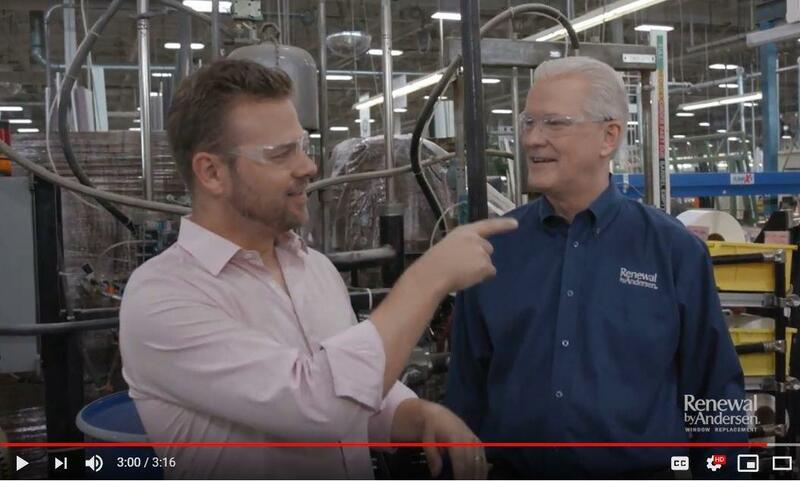 Episode 3: "Measure Twice; Cut Once"
In this episode of Get Inspired with Matt Muenster, Matt goes behind the scenes with Renewal by Andersen president Paul Delahunt and gets to watch how the windows are custom made at the manufacturing facility in Minnesota. Plus, he even gets a sneak peek at his own windows! Episode 4: "Behind the Scenes at the Manufacturing Facility"
It's installation day at the Muenster house and the crew is ready to replace Matt's floor-to-ceiling windows with custom-built, energy-efficient replacements that fit perfectly with the home's architectural style. In this episode, Matt talks with his install crew lead about what exactly he should be expecting throughout the installation process. Episode 5: "What to Expect on Install Day"
Every member of your Renewal by Andersen team shares one goal: delivering a world-class homeowner experience at every stage of your project. That's Signature Service. In this episode of Get Inspired, Matt's window project is nearly complete. We check in on him as he meets with Customer Experience Manager Sam Hall and shares his Signature Service story. Episode 6: "My Signature Service Story"
Matt Muenster had waited a long time to redo the windows in his historic, mid-century modern home. But he finally pulled the trigger--and now, in this episode of Get Inspired... the window installation is complete and it's time for us to do a final walkthrough with Matt and Renewal by Andersen General Manager Andrew Knopick! Episode 7: "The Final Walkthrough"
We've followed home improvement expert and TV host Matt Muenster through his entire window replacement project--from design and tech measure, to the custom build and the installation. We did the final walkthrough with Matt...so what's left? Well, no home improvement show is complete without the big reveal and the party, right? Check out the finished product...and raise a glass for a job well done! Episode 8: "The Big Reveal"
One of Matt’s favorite spaces is in this indoor courtyard, which is literally in the middle of his home. How cool is that? Here’s a sneak peek of the work we did inside Matt’s courtyard. Matt’s home is very unique and the windows were no exception. This timelapse shows the window replacement process from the back of the house--check out that ENORMOUS picture window! When powerhouse designer, contractor, and TV host Matt Muenster was finally ready to tackle the renovation of his 1962, historic mid-century modern, Ralph Rappson-designed home in St. Paul, MN, he knew he wanted to get it right the first time. Go behind the scenes and see how the whole process got its start! Sign up for our atHome enewsletter and you'll get tasty recipes, design ideas, home improvement ideas, and other great content delivered right to your inbox every month!